The Scovilla scale is the measurement of how hot or spicy a chilli pepper is. The scale was first used in 1912 and named after its inventor Wilbur Scovilla. According to the scale chipotles are between 3,000 to 10,000 SHU (Scovilla heat units), and that means a hot chili. The word chipotle is derived from chilpoctli an Aztec word, and is a smoked red dried jalapeño chili from Mexico. The chili is used in Mexican prepared foods as well as Mexican-American, Tex-Mex, and prepared dishes of the southwestern parts of the US, like New Mexico (Link Here for more information about Mexican vs. Tex-Mex: What Is The Difference?). 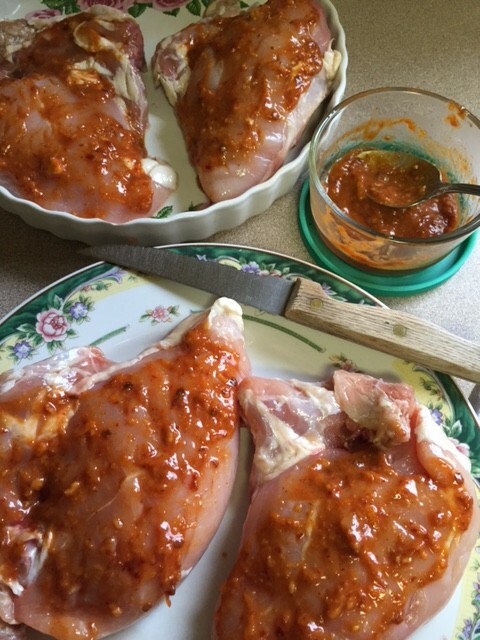 Our featured recipe is an inspiration as it uses the chili to glaze the chicken. We found the recipe in Novembers issue (2014) of “Good Housekeeping.” The glaze is prepared to use while roasting a turkey. We thought why not test it on some chicken breasts and see if our palate could endure the spice while eating the roasted poultry, and if so, it would be used to roast a turkey. 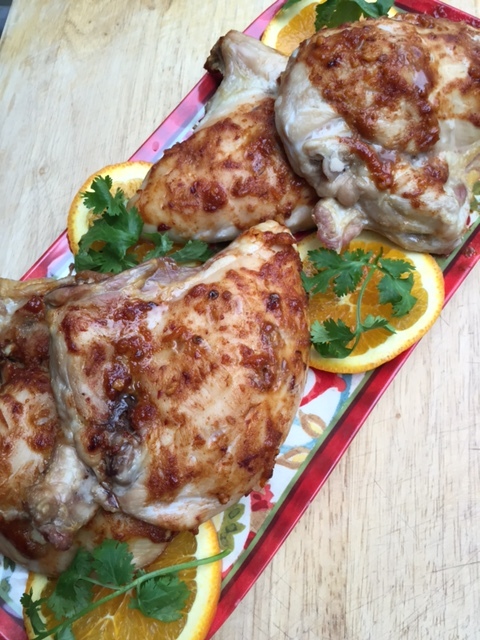 Our featured recipe is Baked Chicken With Chipotle Cinnamon Orange Glaze, and here is what you will need. This recipe was reduced down to accommodate four (4) chicken breasts. For the full recipe to roast a turkey link here: Good Housekeeping. 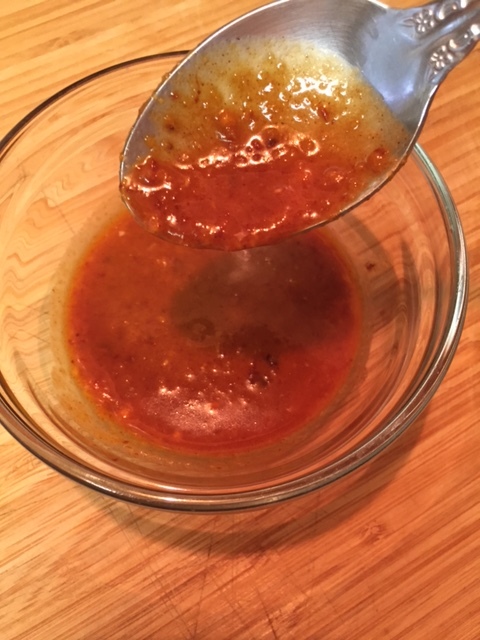 Now let’s glaze some chicken with that Chipotle Cinnamon Orange Glaze. 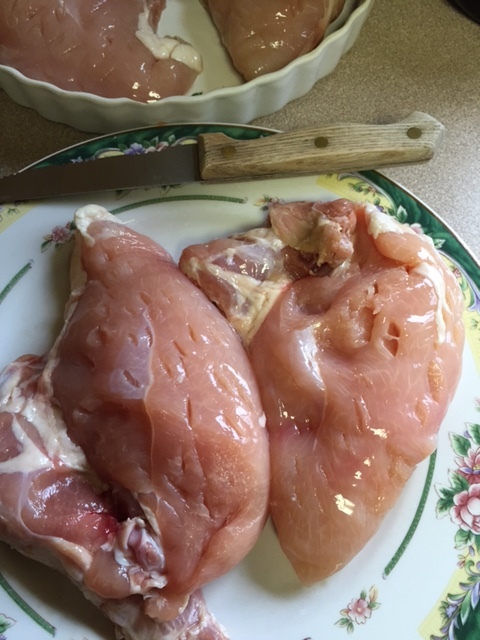 Using a fork or knife, poke holes all over each chicken breast. You can use breast’s with the skin on, but as you can see we have some with the skin removed. Next, spoon on some sauce or glaze and spread out over the meat. Set aside for about 30 to 40 minutes and allow the flavor of the spices to absorb in. 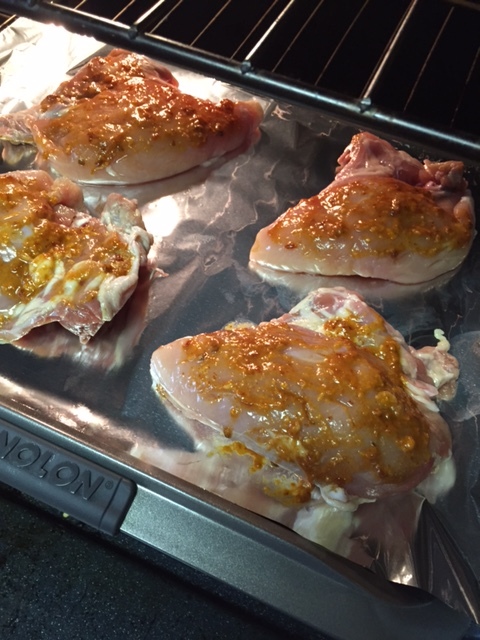 Place chicken into a 350 degree preheated oven for for 40 minutes or until internal chicken temperature is 165 degrees. 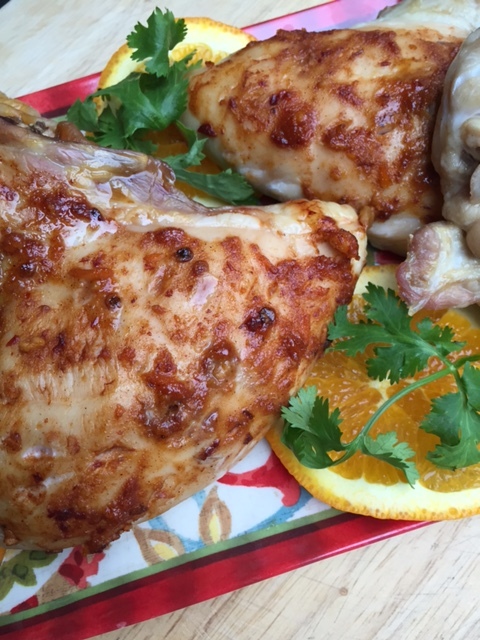 Place the roasted chicken breasts on a platter and serve with an appropriate side dish. Link Here for some suggestions. This entry was posted in Chicken, Dressings, Marinades, Salsas and Sauces, Main Dish and tagged 2012 salmonella outbreak, Associated Press, Autumn, Bankruptcy, Berkeley, California, chicken breasts, Chili pepper, chilli pepper, chipotles, Eastern New Mexico, Himalayan salt, New Mexico, orange glaze, orange zest, Peanut butter, Portales, roasted chicken recipe, Roasting, Scovilla heat units, Tex-Mex. Bookmark the permalink. Looks delicious, Great flavoring for chicken. Thanks Jovina. I tested this recipe out on chicken to see how will it tasted, and to see if it would be worth using to roast a turkey.